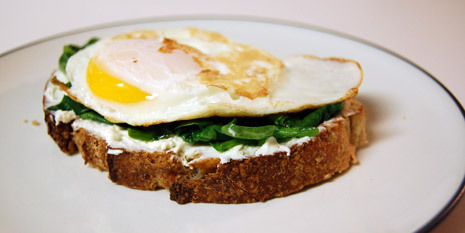 You don’t have to travel to Italy to enjoy local Eggs Florentine. As Farmers Markets open across the Midwest, and other parts of the country, eating locally has just got easier. The following dish (made from a simple recipe that I found in Domino Magazine) is a great one to serve for breakfast, lunch or dinner. I started with a crusty whole wheat locally-baked bread. (The bakery uses ingredients in nearby states — not many of the ingredients found in bread are available in Indiana.) Next, I spread on some Fromage Blanc from Traders Point Creamery (although recipe calls for Ricotta and Parmesan cheese). Atop that, I laid some lightly sauteed spinach from my parents garden and a fried egg (fresh from Phelps Family Farms stand at the Carmel Farmers Market). The result was a hearty, rich and healthy dish. Bellissimo!